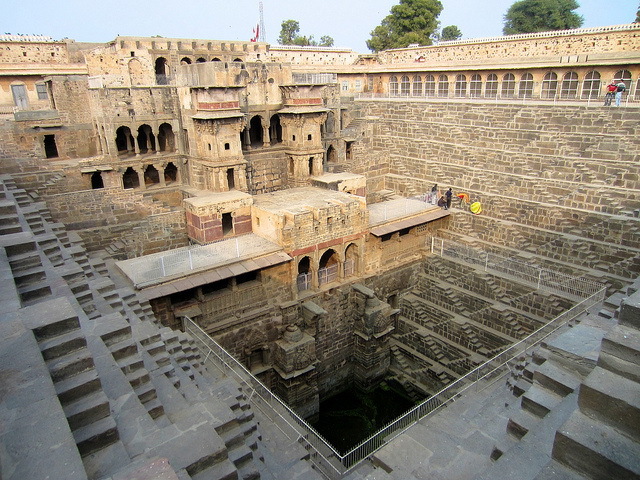 The Chand Baori is a stepwell built over a thousand years ago in the Abhaneri village of Rajasthan. It is one of the largest stepwells in the world and also one of the most beautiful ones. 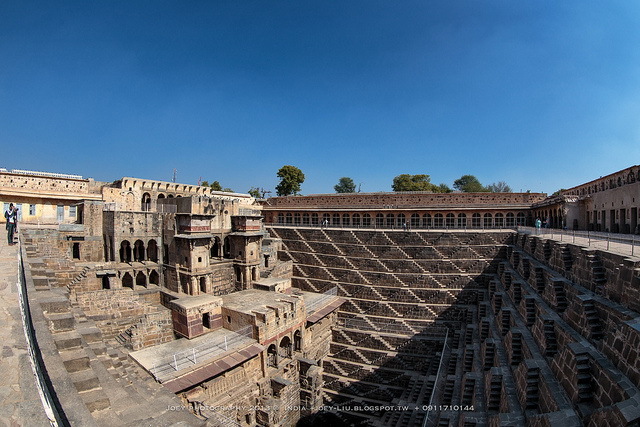 The Chand Baori is not an easy landmark to find, thus it is one of the hidden secrets of India! Stepwells, also called bawdi or baori, are unique to this nation. The wells have steps built into the sides that lead down to the water. Chand Baori one was built during the 8th and 9th centuries and has 3,500 narrow steps arranged in perfect symmetry, which descend 20m to the bottom of the well. Centuries ago, the stepwells were built in the arid zones of Rajasthan to provide water all year through. About 64 feet deep, it is India's largest and deepest stepwells with 13 floors and was built in the 9th century for water harvesting. It was so named as it was built by King Chand Raja from the Gujara Pratihara clan, who claim to be the descendant of Lord Ram's younger brother Laxman. The Pratihara dynasty was at their peak during 6th-10th century AD, and also ruled over other parts of Rajasthan. Their capital was Mandore near Jodhpur. The baori has a precise geometrical pattern, hard to find in this age. The steps form a magical maze and the consequent play of light and shadow on the structure gives it a captivating look. It has an enclosed rectangular courtyard kind of structure. Upon entering you reach a jharokha (windows). Descending the stairs on the left, you can see the cavernous baori narrowing towards the bottom, criss-crossed with double flights of steps on three sides to reach the water surface down below. The stairs encircle the water on the three sides while the fourth side boasts of a pavillion with three storeys with beautiful carved jharokhas, galleries supported on pillars and two projecting balconies enshrining beautiful sculptures.